Keeping with my reading plan I was overdue for some nonfiction. 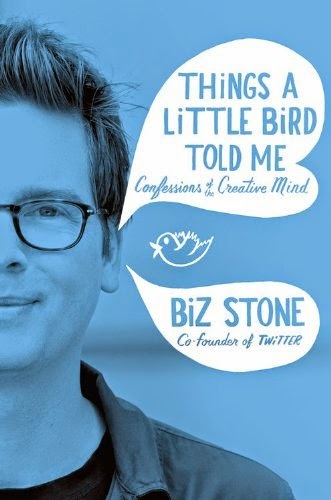 I've been a big fan of Twitter since 2008 so I decided to give Biz Stone's memoir/essays a go. I am glad I did. Great memoir and inspirational essay. Biz is the kind of person I like to hang out with. His risk taking, career-wise, is a familiar story and I love, love, love, how he is trying to make the world a better place. I have followed my passions throughout life, making some decisions that definitely didn't make for a plump pocketbook but I've not been bored. Like Biz and his wife, Rick and I have taken off across country on the chance a new job would work out and in addition to that we also rented a place sight unseen that didn't work out as well as hoped. We also left lucrative jobs to be where we wanted to be and to do what we wanted to do. I would love to know what Biz's Meyers-Briggs letters are. I'm definitely a reluctant reader when it comes to nonfiction but I found this thoroughly enjoyable because of Biz's exuberant way of living his life.